Want to get the perfect fit jeans but don't know where to start? Read our quick and simple guide to find out everything you need to know about getting the best fit for your body type. What jeans should I wear, you ask? Well, unlike our female counterparts, us chaps are fairly limited on the trouser front. Apart from the odd pair of chinos or joggers we might have kicking about, jeans tend to be thing that gets the most wear in our wardrobes. Whether rocked to the office or uni each day or saved for downtime on the weekend, jeans go through their fair share of wear and tear, so finding a pair that fits well, looks good and will last is essential. It's therefore no surprise that when we eventually find that pair that ticks all the necessary boxes we practically end up living in them. However, before getting to that stage there's bound to be a number of trying-on sessions - not to mention deliberations between one wash and another - before hitting the denim jackpot. To help you with your quest for the perfect pair, here's the lowdown on five key styles and how each of them fits. 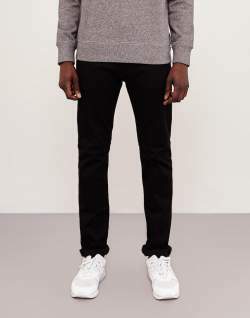 If you've still got youth on your side and your legs don't resemble tree trunks, then a quality pair of skinny jeans - especially in black - can be an invaluable asset to your wardrobe. Make sure you allow for a degree of stretching in the waist, thighs and knees by buying them a size down. Initially, they'll feel snug through the thigh into the calf and ankle, but if you buy quality they will eventually mould to your body shape, leaving you with a great pair of versatile jeans. 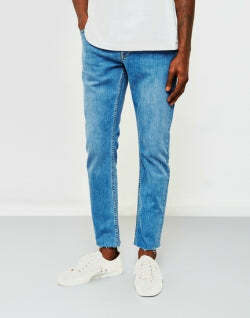 These are without a doubt good fitting jeans. Wanting to achieve the super skinny look, but don't fancy losing circulation in your legs? The super skinny look is a distinctive vibe that a lot of people want to achieve, but for a more comfortable outfit with the same kind of look, go for a skinny fit jean. You still need to be fairly confident with your figure as these jeans are going to be far from loose, but they're easier to pull off and move around in than their super skinny counterparts. For a more understated, alternative look you can easily make your jeans the main focus of the outfit and pair them with a simple cuffed sleeved T-shirt, a robust jacket and simple slim line trainers. 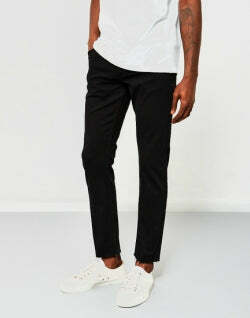 Unlike super skinny jeans, you can cuff your skinny jeans to create a more complex, dimensional look. 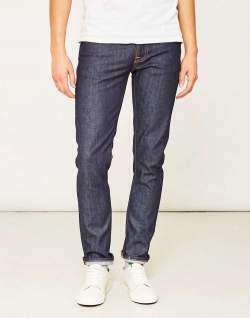 If you're after a happy medium in the denim department then a pair of slim fitting jeans is definitely the way to go. They should lightly hug your thighs and knees and start to loosen up through the calves and into the ankle. Whether you opt for a raw finish or a stonewash, they're guaranteed to be a worthwhile addition to your casual wardrobe. Wear them cuffed so they sit just above your footwear or simply allow them to stack up depending on your preferred style. A gym bunny whose legs are defined and a little bit bulky, but who wants to achieve a well-fitted look with their jeans. Because of its loose but tapered design it's good at giving a slimming, elongating effect - perfect for if you want to appear taller and more slender. 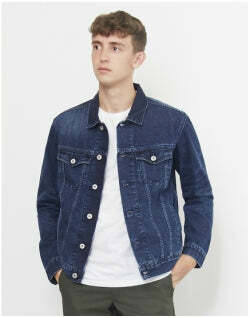 A slim fit jean in a raw denim is a good option if you want to tackle the double denim look. Its rough, casual look will give a more masculine vibe to the outfit, and if you cuff the ends you'll create a dimensional look that will add a small contrast to the overall look. 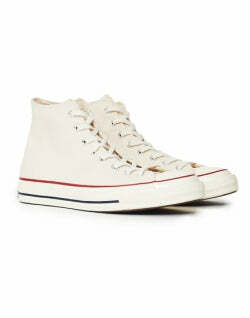 Pair with some clean lace up boots, a denim shirt and layer a white T-shirt underneath. The tapered fit is becoming increasingly common as it still offers a clean cut without the restriction which can find be found with skinny and slim fits. The classic design gradually tapers at the ankle while still retaining a generous fit through the thigh and into the calf. If this is the fit for you then be sure to cuff the hems a few times so they sit just on top of the ankle. A great fit for the warmer weather. A little beefy in the leg department and want to achieve a clean, tailored look while avoiding the wide leg look. Because the jeans are wider in the thigh but slim down in the calf, your legs won't be drowned in material, but you'll still have a little more room to stretch in without getting a skin tight look. Tapered jeans go with such a huge variety of outfits that it's hard to nail down just one look. However, because of its unique look you can go super simple and still achieve a clean, stylish outfit. 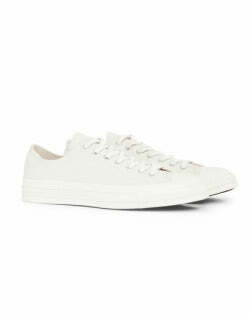 Try pairing a raw denim pair with a crisp white shirt, a leather bomber jacket and a classic pair of high top Converse trainers. 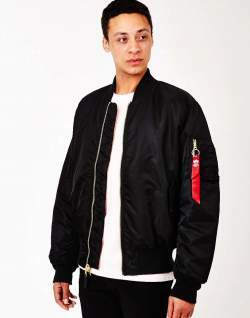 Last up is the straight fit - while it's a less favourable style for most these days, they can still look just as slick as any of other fits we've featured as long as you buy them in the correct size. By their very nature they fit more or less the same through the thigh and into the ankle, so they'll lightly hug the thigh while loosening out through the calf and into the ankle. It's best to cuff this sort of fit or have them taken up by a tailor so they don't swamp your footwear. 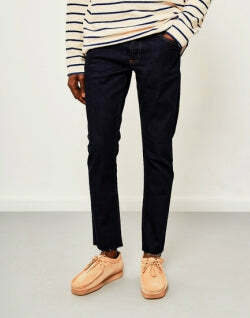 If you prefer your jeans go straight down and not to cling to your legs then this style might be for you. They're good at creating an elongated shape, perfect for an all round flattering look. Straight jeans are better at keeping their shape than skinny jeans as sometimes skinny jeans loosen and lose their style. Because of the loose fit of the jeans, a tighter fit top will keep your outfit balanced, and create a neat contrast. Straight leg jeans go with a number of looks, but because of their comfort focused look, they're great for throwing in with a mix of casual pieces. You could go for a super casual outfit by matching a slim fit grey sweatshirt with some simple lace up trainers.